I have been very fortunate to have developed good friends because of my stamping. I am very grateful for each and everyone of them. My stamping gives me satisfaction, happiness and peace in my life. It is a way to express myself and spend time with others who all possess wonderful talents. For all of this I am so blessed. This year was my first opportunity to go to Stampin'Up Leadership in Orlando last month. The stamp set given to all the attendees was " Good Friend". Our package also contained DSP paper, Good Morning Sunshine and a package of On Board So Tweet chipboard to make the project pictured and several additional items. 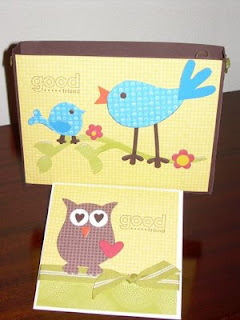 The bird, owl and branch were covered with the DSP paper before being put on the bag front and card . If you are attracted to owls and bird you might want to consider a package of the chipboard there are 8 of each in the package. If you purchased one of each item: paper, stamp set and chipboard you would also qualify for a FREE stamp set out of the Sale-A-Bration mini. The Sale-A-Bration promotion is on now until March 31st. You can click on the brochure on this BLOG and see the you can get for free with each 50.00 merchandise purchase. Join SU as a demonstrator before March 31st and receive extra products and stamp sets FREE.